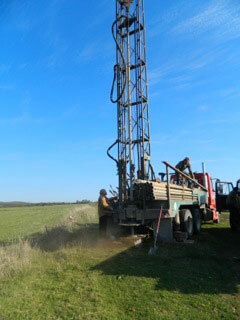 The well-drilling rig at work on the Fishers’ farm. We drilled a drought well today thanks to Mickey Moore Well Service and the state of Oklahoma. I have 14 farm ponds with 3 good enough to still use. This well will furnish water for three pastures. With no water for so long the well will be a blessing. Good well water is scarce on our farm – the biggest well started out at two gallons a minute. I do not think this one is that good yet. The plan is to use a solar pump and a stock tank. It was so interesting to watch everything work. 160 feet deep. A foot every minute. It blows a lot of dust until they hit water. When they drill through layers of limestone it makes the whole truck shake. I was in the middle of planting a wheat field when the driller showed up. After a few hours of watching the well being drilled I finished my wheat planting.